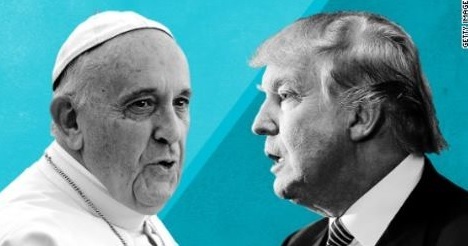 On Thursday Pope Francis accused Republican frontrunner Donald Trump of not being Christian because of his plan to build a security wall and fence to protect America from the illegal immigrant invasion. Trump responded to Pope Francis with a statement which he read at a South Carolina rally this morning. After the uproar from pundits, religious leaders and Christians who believe in state borders, the Vatican tried desperately tried to clarify the pope’s remarks today. Rev. Federico Lombardi told Vatican radio on Friday the comments were “in no way a personal attack” on Donald Trump. The papal spokesman is stressing that Pope Francis often says build bridges, not walls, and that his remark while flying back from Mexico wasn’t targeting U.S. presidential candidate Donald Trump. Francis said Thursday that a person who advocates building walls for solutions is “not Christian.” Trump, who has repeatedly called for a wall to divide the United States and Mexico, retorted it was “disgraceful” to question a person’s faith. Lombardi noted Francis often has advocated “building not walls, but bridges,” especially regarding Europe, as it struggles to handle the arrival of hundreds of thousands of people fleeing war and poverty. On Thursday night, Trump softened his rhetoric on the pope after blasting the leader of the Catholic Church. Trump said during a town hall event on CNN that he now believes the pope’s remarks were “probably a little bit nicer” than first reported. This was not accurate or honest. The remarks by Pope Francis were in response to a direct question on Donald Trump, were directed at Trump and were an attack on Donald Trump. This Vatican is not being honest. Q: Good evening, Your Holiness. Today you spoke eloquently about the problems of migrants. On the other side of the frontier there’s a very tough electoral campaign going on. One of the Republican candidates for the White House, Donald Trump, in a recent interview, said you are a “political man” and that maybe you are a pawn of the Mexican government as far as immigration policy is concerned. He has said that if elected, he would build a 2,500-kilometer-long wall along the border. He wants to deport 11 million illegal immigrants, thus separating families, etc. I would like to ask you, first off, what do you think of these accusations against you, and if an American Catholic can vote for someone like this. A: Thank God he said I was a politician because Aristotle defined the human person as “animal politicus.” So at least I am a human person. As to whether I am a pawn, well, maybe, I don’t know. I’ll leave that up to your judgment and that of the people. And then, a person who thinks only about building walls, wherever they may be, and not building bridges, is not Christian. This is not in the Gospel. As far as what you said about whether I would advise to vote or not to vote, I am not going to get involved in that. I say only that this man is not Christian if he has said things like that. We must see if he said things in that way and in this I give the benefit of the doubt.